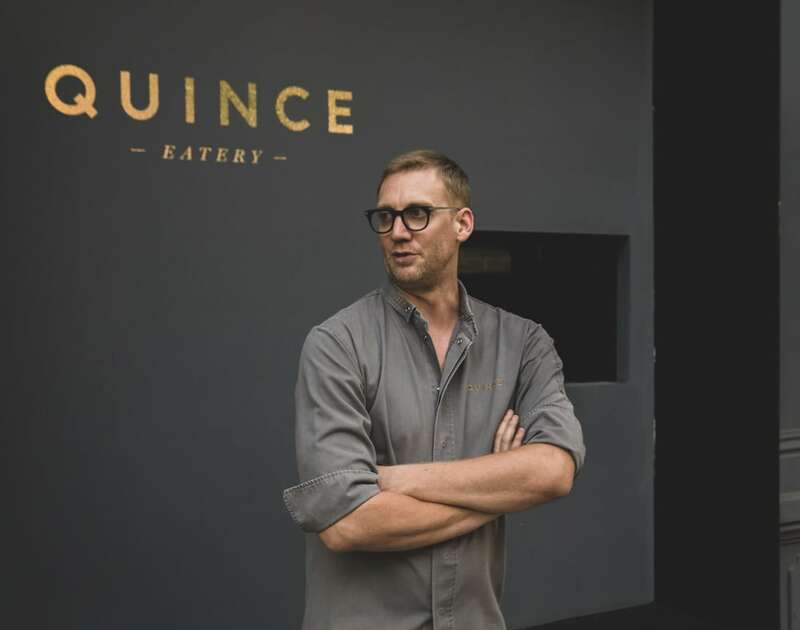 It’s a culinary style that fits the imposing-looking chef then, a cook who’s so tall they lowered the kitchen floor at Quince Saigon by 30-centimeters to accommodate him. He also appears to have a missing front tooth, “which people always ask about expecting a story about a fight in a bar…but actually it just never grew properly and it’s shorter than the rest…” he explains. Chef of the year, Julien Perraudin, outside Quince Saigon at 37 Ky Con, District 1. 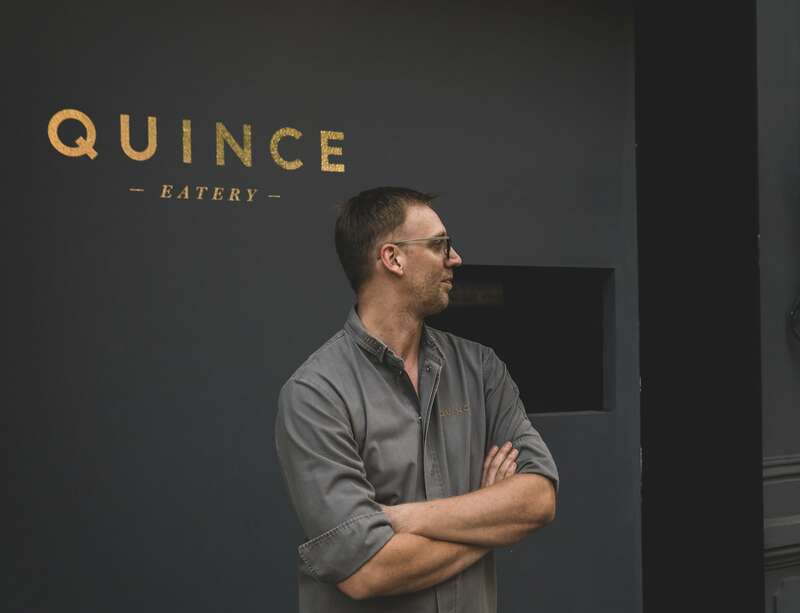 Since opening in early 2018, Quince Saigon has impressed so much that Julien carried away the Chef of 2018 prize at our Vietcetera Restaurant and Bar Awards—one of three-trophies they won that included runner-up for the People’s Choice Restaurant of 2018 and runner-up for the Grand Jury Prize Restaurant of 2018. Considering all this, you’d be forgiven for thinking Julien’s had an easy ride to the top. 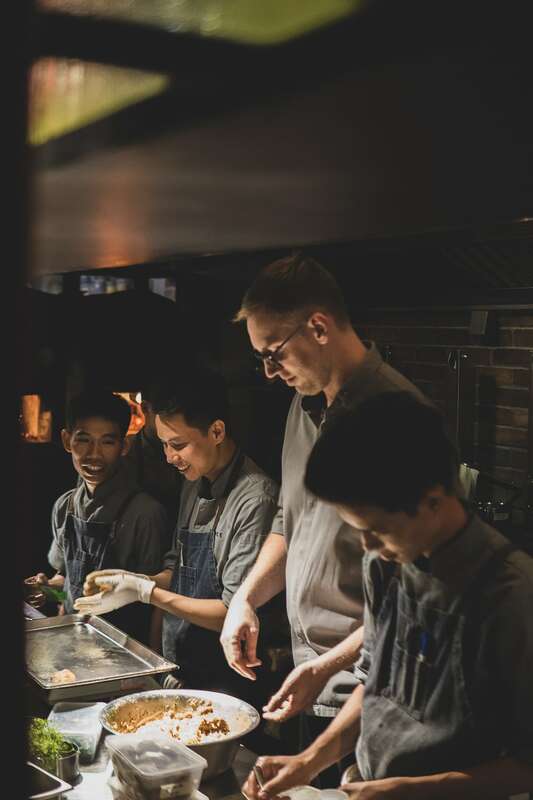 But behind the chef’s confident coffee-wood fire licked dishes made in a style he developed in restaurants like The Botanical in Melbourne is a tough ascent with lots of moments he almost threw it all in. So, we headed over to Quince at this grimy, industrial end of Ky Con to find out how Julien Perraudin made it this far, and what’s got him all fired up. 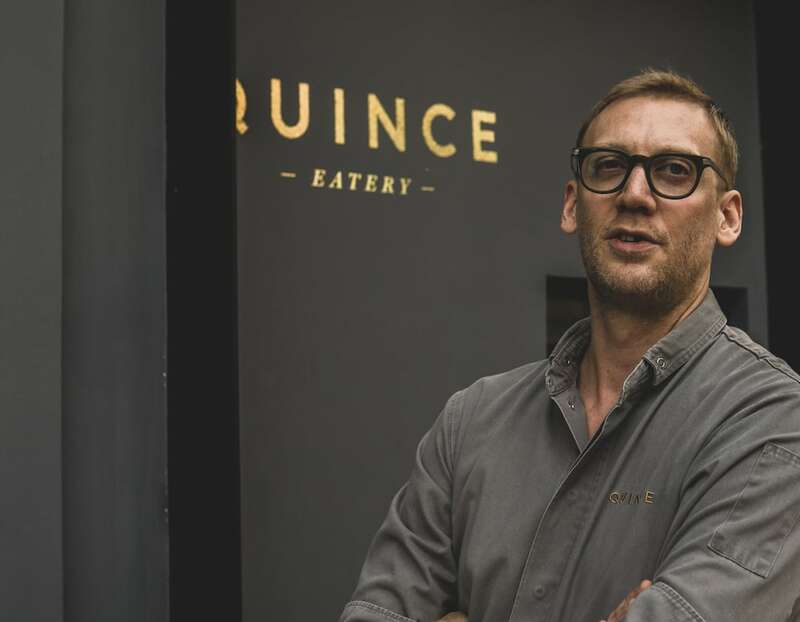 Why name a restaurant after a rather obscure small fruit—the quince? I think it may have originally been a reference to the music producer Quincy Jones. Plus the Quince is a fruit that’s common in both Mediterranean and Middle Eastern cuisines; both are strong influences on what we do here. And compared to apples, quinces are these kind of ugly, obscure fruits—not disimmilar to me! At Quince Saigon, you’ve even made cauliflower cool. What’s the story behind that dish? And is there any vegetable whose image you couldn’t rehabilitate? 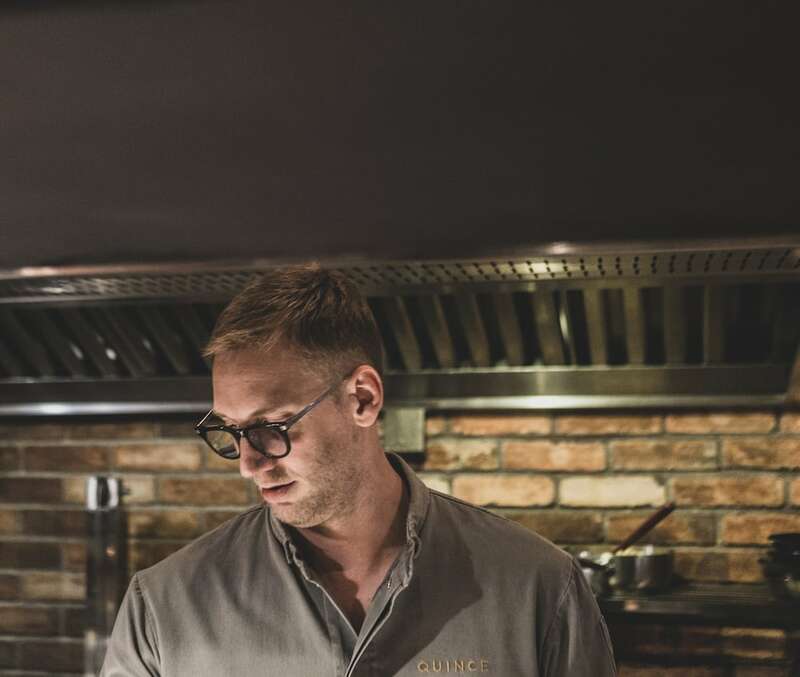 In Bangkok, I cooked with Pierre Bouko-Levy, the chef behind Paris’ French-Israeli restaurant empire Miznon, a few times. He does a cauliflower in a similar way in his restaurant. He cooks the cauliflower whole in water then roasts it with oil and salt, then he serves it with a tahini sauce…and it’s delicious. We do it the same way, but the cream or foam we use is a nod to French cauliflower gratin. Myself and Pierre plan to do a four-hand dinner here at Quince Saigion sometime in August. And I’d serve any vegetable—I think we should all eat more. The less-attractive the better. “I’m not one to walk through the restaurant greeting guests. I find those conversations awkward and inauthentic…I probably need to work on my social skills,” the French-born chef admits. Do guests at Quince Saigon ever complain that the food is burnt? Haha, very rarely we might get a customer who complains—the bread does come out a little blackened…but not burnt. With the open kitchen I often pick up what couples are saying at the counter so I’m constantly getting feedback. I think that relationship is crucial. I think visibility is important for a chef too. However, I’m not one to walk through the restaurant greeting guests. I find those conversations awkward and inauthentic…I probably need to work on my social skills. No, there were many times I thought about quitting. The culture at my culinary college in Burgundy was so toxic—with horrendous bullying of young chefs like me—that I never wanted to work in kitchens. The college welcome alumni back to give talks. It’s very tempting to return and tell the truth; that I became a chef despite them and not because of them…. Fortunately, I did an apprenticeship at a local Michelin-starred restaurant called Le Manoir de Sornat under chef Gerard Raymond. He strongly encouraged me to travel like he had done. 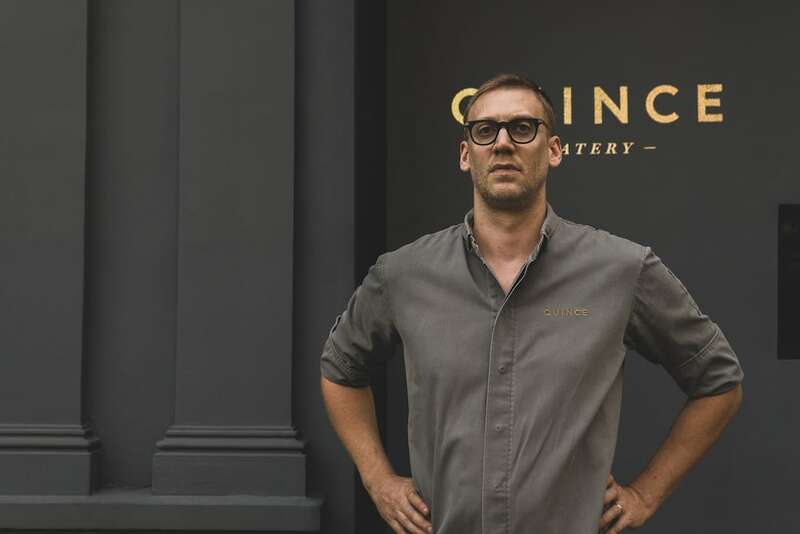 First, I went to London, but even though I had the chance to work in restaurants like The Orrery I still felt disenchanted with the profession. I viewed it more and more simply as a way of traveling rather than a vocation. That changed when I arrived in Australia. Because of restaurants like The Botanical in Melbourne, and Salon de The in Sydney I fell in love with cooking again. To you, what are the key components to successfully making wood-fire cooked food? And how much wood do you go through a week? Of course, the oven and the grill are important. Ours were custom-made. And the grill has a special lowering mechanism. I wanted a grill like the one they have at Asador Etxebarri. In fact, we’re making another to send to Bangkok for the reopening of Quince there. The wood is important too. We go through one ton of wood per week. So far, we’ve experimented with different kinds. There’s mangrove—which is very good wood but it’s hard to tell how sustainable it is. We also used acacia, before settling on coffee wood. With such a passion for locally-sourced ingredients, which ingredient is getting you most excited now? We’re constantly discovering new locally-sourced ingredients—Dalat figs, finger limes. Our chefs are always giving me suggestions too. They’re very knowledgeable and understand what might be interesting to us—some ingredients we incorporate, others we don’t. The finger limes are particularly good—they’re a fruit that tastes something like a citrusy caviar with wonderful floral flavors. A supplier’s started growing them in Dalat, and they taste even better than in Australia. They’re very expensive however so we use them sparingly. Generally, how does Saigon compare to Bangkok for produce? The vegetables are better here. Every European vegetable—perhaps due to the French legacy—is very good. In Bangkok you have to find boutique farms, with boutique prices, to get anything like the same quality. The quality and range of seafood is better here too. And the availability now, compared to when I was with KOTO Saigon, is far greater. The coffee here is excellent too—we use K’oh Coffee. However, in Bangkok you have access to better organic poultry and pork. Neon lights on the Quince Saigon restaurant wall remind guests of the concept’s journey. 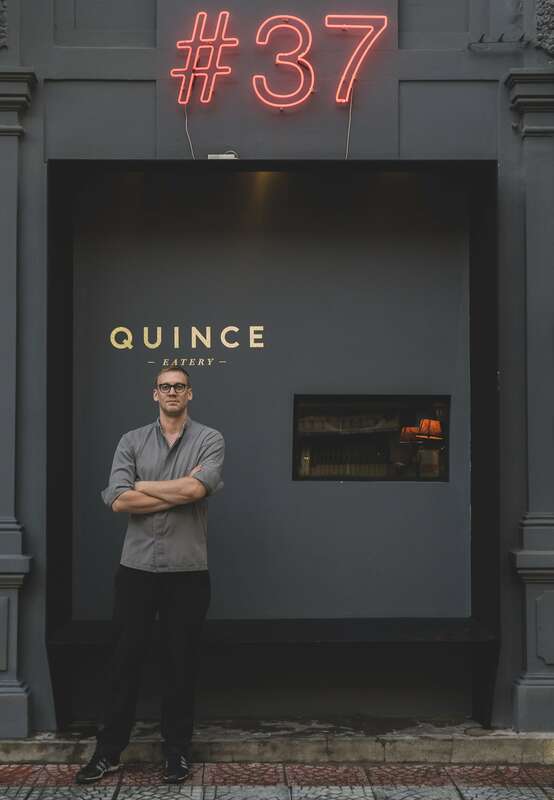 Imagine you’re visiting Quince Saigon as a guest—which night of the week do you come and what do you order? I prefer not to eat out on Fridays or Saturdays. So, Wednesday night—as I think Wednesday is also generally accepted as the best day to visit a restaurant by foodies. I’m a late eater, so I’d come around 9pm. And I’d order everything—I don’t believe in holding back when I visit a restaurant. At Quince Saigon, lots of playful things are happening with the appetizers and vegetables. The mix of flavors and ingredients are exciting like the merguez with hummus which is something I make at home. I take my hummus very seriously—lots of garlic, because I’m French, olive oil, cumin, tahini. I like full in-your-face flavors, something I learned in Australia. If I’m in the mood, I would order a steak afterwards. For me the key to a good steak is great meat that’s well-cooked—that’s all. The only thing we add—which is also typically French—is mustard. We home-make ours, like our paprika and oregano, tarragon, doenjang, smoked whiskey, and pickled mustard seed. And we just added Atlantic halibut with bacon dashi stock finished with butter and a lot of vegetables from Dalat to the specials menu. So I’d order that too. Where will we find you in Saigon on your nights off? I like Octo Tapas Restobar and Tomatito. I like to eat George’s food at Stoker. I liked Calvin’s tacos at Sanchos—I used to work in a Mexican-South Californian restaurant in Melbourne so I’m difficult to please, although Julio Gomez made us some tacos at Tomatito one night that were sensational. I also pay weekly visits to two places near to Quince: Marcel Gourmet Burger and Pho Vu Vuong. I also go to the Deck from time to time, and to Al Sham for their Middle-Eastern food. And my wife is from Issan Province in Thailand, so we visit Somtam Der for our fix of Issan food. And if Vietcetera could fly you to any restaurant in the world for the night, which would you choose? It’s impossible to choose only one—can I have more? So, there’s Momofuku in New York. El Celler de Can Roca in Spain. And Etxeberria. Then there’s Septime in Paris. And I would like to say Noma, but I reserve my judgement on that restaurant until I’ve tried it. Then there are some places in Japan—like Narisawa where chef Toshio Tanabe serves a soup made from soil. Eating anything in Kyoto blew my mind—even the shittest izakaya made the most incredible dishes. So a trip to Kyoto would be fine for me too. Finally, what’s in your refrigerator at home? A lot of Sapporo. Some shochu. And lots of cheese and salami and condiments like mustard, and some kimchi. All photos for Vietcetera by David Kaye.